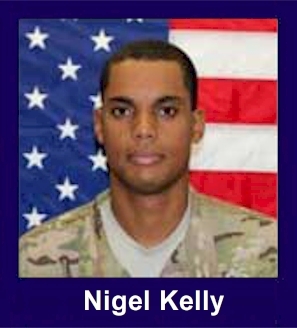 The 35th Infantry Regiment Association salutes our fallen brother, SSG Nigel D. Kelly, who died in the service of his country on June 25th, 2011 in Kunar Province, Afghanistan. The cause of death was listed as Small Arms Fire. At the time of his death Nigel was 26 years of age. He was from Menifee, California. SSG Kelly was a comabt engineer supporting B,2/35th. Nigel Kelly grew up a star basketball player in California at Temescal Canyon High School, where he was also remembered as a hard-working and serious minded student. He was named to The Californian's All-Valley Boys Basketball Team for the 2002-03 season. The crowd cheered Nigel on as he scored 13 points in the 2003 High School All-Star Classic shortly before enlisting in the Army. "He was very well-liked," said coach Williams, now the school's athletic director. "It's very sad and makes you reflect on what an outstanding young man he was. "We'll miss him and wish the best for his family, which must be very proud of him." Neighbors said they saw Army officials at the house Monday morning informing the residents of Kelly's death. "The military showed up and then all the family started coming over," said neighbor Chris Ellis. "It's a sad affair." Nigel Kelly joined the Army in 2003 as a Combat Engineer. He trained at the Schofield Barracks in Hawaii. Staff Sgt. Kelly spent two combat tours in Iraq before deploying to Afghanistan where he lost his life in combat. Staff Sgt. Kelly's awards and decorations include two Bronze Star Medals, one with Oak Leaf Cluster, Army Commendation Medal with Oak Leaf Cluster, and Army Achievement Medal among many other decorations. Staff Sgt. Kelly leaves behind his family and friends back home in California, and his troops. Staff Sgt. Kelly is missed. May he rest in peace.